I fly, you fly, we all fly! 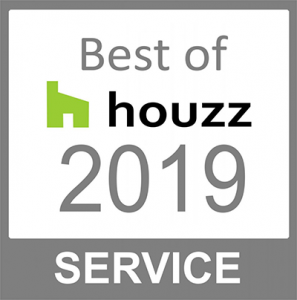 At least–you should! And when you do, it will be an exhilarating and over the top experience! This is how I must describe iFLY indoor skydiving in Yonkers, New York. Yes, this is a thing and you have to try it to believe it. This Monday was like no other Monday, as I took flight, literally capturing the wind beneath my wings. As we prepare for launch of Season Three in September, 2019, I thought to begin the season doing something over the top and fun. Truth be told, we are no strangers to team building exercises and outing – and we never lose sight of the fun! So I quickly coordinated an aMARzing morning for Executive Producer Chris , Head Writer Paul and myself to take to the air. 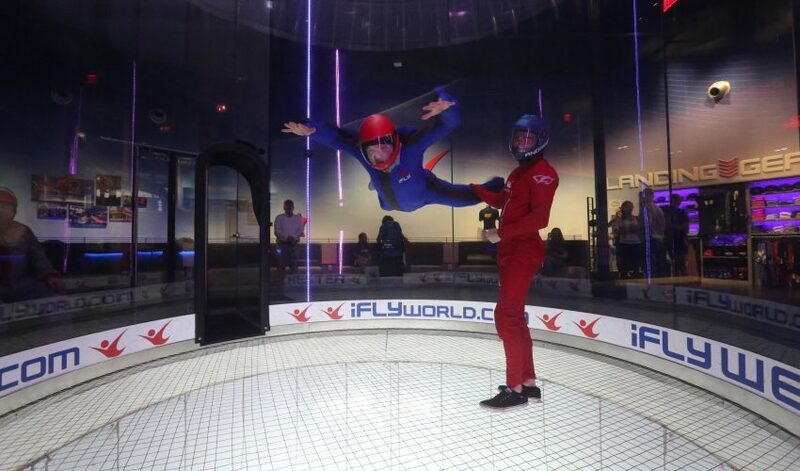 Indoor skydiving is in a vertical wind tunnel that simulations true free-fall conditions. 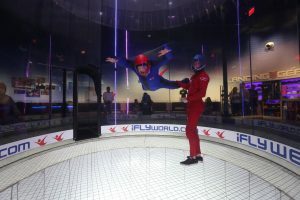 The invention of modern wind tunnels has given skydivers a consistent and practical way to develop and hone skills usually only used when jumping from a plane. Additionally, the increase in availability of wind tunnels has created a whole new genre of sport – bodyflight. It is one of the most exciting and fastest growing sports in the world and I am the latest junkie! I could not believe that over one million people have already experienced the power of iFLY flight. It’s easy for everyone in the family, as there is no plane, no parachute and no jumping necessary. Just you, the flight instructor, and a smooth cushion of air providing a huge sense of freedom. Even Paul, who’s more than a bit wary of heights, had no problem. And Chris loved it! He and I opted for the Virtual Reality option to finish it off–while still in the tunnel, an attachment on our helmets made it look like we were on a true free fall. Chris “jumped” over the Swiss Alps, and I got to soar over a beautiful beach coastline. We all felt it was quite a rush, and want to go back.